JERUSALEM (JTA) – The Israeli political scene has always been one of stark contrasts between the two most iconic, if not always most successful, parties: dovish Labor vs. hawkish Likud. While Likud leader Benjamin Netanyahu drew huge numbers of settlers in his most recent election as prime minister, uprooting Jewish homes in the West Bank was taken for granted in multiple Labor-led peace efforts since party leader Yitzhak Rabin signed the Oslo Accords in 1992. But the head of the reliably pro-peace Labor Party defied that dynamic in an interview broadcast Tuesday, saying he would not evacuate settlements as part of a final status agreement with the Palestinians. Avi Gabbay told Channel 2 that the notion this is necessary is mistaken. Various Labor leaders and others in the opposition distanced themselves from Gabbay’s comments after they were aired Monday in a preview. Under former prime ministers Rabin, Shimon Peres and Ehud Barak, Labor pushed for peace, and few doubted settlers would have to move west of Israel’s new border. Gabbay’s comments seem to move his center-left party rightward at a time when he is vying with Yesh Atid leader Yair Lapid to be the centrist alternative to Netanyahu. Both men are adopting some of the prime minister’s positions in the process. And with some exceptions, Gabbay and Lapid have refrained lately from seriously attacking the prime minister, even as police investigations swirl around Netanyahu, his family and associates. Abraham Diskin, a political science professor at the Hebrew University of Jerusalem, noted the Israeli political map has shifted rightward in recent years as faith in peace has dwindled. 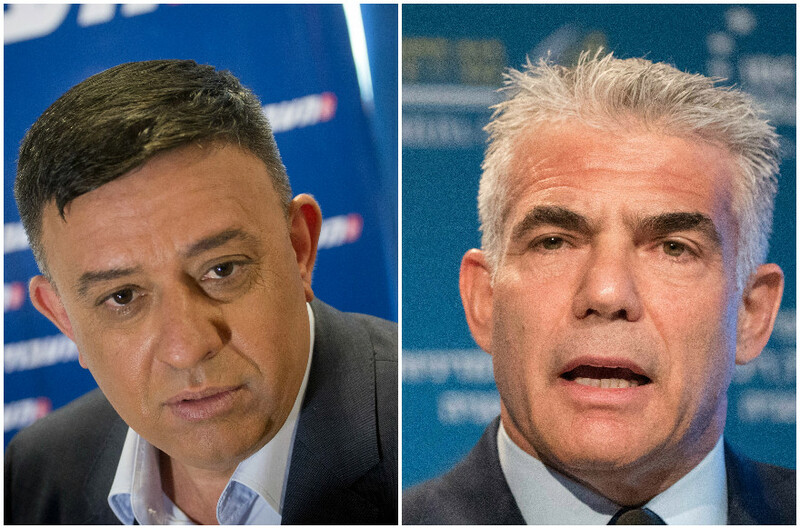 Both Gabbay and Lapid hope to win over some of the prime minister’s traditional Likud supporters, he said, which is why they can sound like him. Gabbay, who last year resigned as a minster in Netanyahu’s government, first made headlines this week at a Shabbat event in the southern city of Beersheba when he declared that unlike previous Labor leaders, he would not be willing to join a governing coalition with the Arab parties that make up the Joint List — of which Netanyahu is a frequent critic. Arab parties have never served in an Israeli government, and remain opposed to doing so. But even after Gabbay’s comments, Joint List head Aymen Odeh did not rule out supporting a Labor-led government from the opposition as Arab parties did during Rabin’s 1990s peace efforts. On Sunday, Gabbay told a crowd in Dimona that he is not sure there is a Palestinian partner for peace. Netanyahu has said repeatedly he is sure there is not. In the interview Tuesday, Gabbay made another surprising statement in addition to the one about settlements. He said Netanyahu should only step down if indicted on allegations that he took bribes — allegations Netanyahu denies. Other figures on the left have called for the prime minister’s head in the wake of the corruption allegations. Asked how his position on settlements differed from that of Netanyahu, who has said that uprooting settlers would amount to ethnic cleansing, Gabbay said he was committed to reaching a deal — unlike the prime minister. “There is a huge gap between those who at least want to get there and those who don’t want to get there,” he said. Lapid remained silent. But in an essay in the Atlantic magazine last week, the Yesh Atid leader supported Netanyahu’s hawkish views on Iran, as has Gabbay. Lapid accused Tehran of lying to the West and using the nuclear agreement to move toward becoming a regional nuclear power. Iran has denied it seeks nuclear weapons. In fact, Lapid has found consensus at times with Netanyahu since the start of his political career. After his upstart party’s surprising election showing in 2013, Lapid ruled out trying to form a government with the Joint List. He called its members “Zoabis” in reference to the anti-Zionist Arab-Israeli lawmaker Hanin Zoabi, whom Netanyahu has repeatedly sought to silence. Instead, Lapid became Netanyahu’s finance minister. Lately, Lapid has struck a statesmanlike pose. In January, he reminded Israelis that Netanyahu is “innocent until proven guilty” and criticized Gabbay for attending a rally demanding the prime minister be brought to justice. In February he expressed hope that Netanyahu would not be indicted. Gabbay and Lapid have so far held their fire against each other, too. When Lapid did attack his rival, shortly after Gabbay won the chairmanship of Labor in July, Lapid subsequently took back his comments. Yohanan Plesner, the head of the Israel Democracy Institute and a former director-general of the now-defunct center-right Kadima party, predicted that in the next election — which is slated for November 2019 but could come sooner — voters will rally around the most credible centrist. He said left-leaning voters and leaders will forgive the candidate some Netanyahu-like rhetoric in the interest of ousting Netanyahu himself.